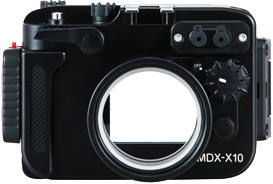 Related Information Notice: The MDX-X10 housing is compatible with Fuji Film's X20 camera. 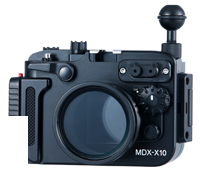 The MDX-X10 housing has been confirmed to be compatible with Fuji X20 camera without any modifications. All the necessary controls of the camera for underwater use are accessible. The MDX-X10 housings shipped from Japan as of March 8th, 2013 come with button indicator stickers for the Fuji X20, when the housing used with the X20, affix the stickers. Click here to get detailed information regarding compatibility with the Fuji X20. Promotional video for the MDX-X10 (for the Fuji Film X10 and X20) has been posted on YouTube. The M67 Wide-conversion Lens can be mounted on the port or the Close-UP Lens 12552119 can be attached to the port with the M67-M62 Step Down Ring58122. * The camera’s zoom is limited to 85mm with exclusively designed rubber gear due to the structure of the port. The port end is threaded so that various options including the M67 Wide-angle Conversion Lens 0.6x can be mounted.Angle of view increases from 28mm to about 21mm (35mm film camera equivalent). The MDX-X10 is an ergonomically designed and precision machined underwater housing made from solid block aluminum alloy.The housing is compact and has a small internal volume reducing excess buoyancy. By inserting the Fiber-optic Cable L-type into the housing connector, an external strobe will be optically connected to the camera’s built-in flash enabling full-featured strobe photography and creative lighting expression. Smooth and easy adjustment of the zoom lens and camera power switch by an exclusively designed power/zoom control.The rear multi-point controller allows for subtle and fast control of the camera’s sub and main command dials. The playback button, AE/Enlarge button and WB button are each situated for ease of operation. While mounted inside the housing, the camera flash can be activated or disabled with the flash control button and disablement lever. Anti-slip rubber areas are located in the upper right and left corners of the rear case. These areas hold the housing securely to ensure proper alignment. Rugged construction with depth rating of 100m/330ft.